An intriguing surprise from Kent-based label Sugarbush, who have previously specialised mainly in English psych-pop, this vinyl release from Detroit-based Piunti came out on CD to wide acclaim in the States last year, and here re-emerges with two strong bonus tracks. Piunti is one of those never-quite-made-its whose passion for music has remained undimmed by a lack of commercial success. Beginning in 1975 with a band called Dwarf (who changed their name to The Take in the ‘80s), he abandoned music for a while to raise a family before returning with little fanfare to release a solo album in 2002, after which he made a couple of albums as The Respectables. Not everyone makes their best music in their youth, however, and perhaps Piunti’s time has finally come, as this is an accomplished and enjoyable instant powerpop classic, full of driving guitars, sing-a-long melodies and hooks a-plenty. Piunti’s also recruited himself a very fine backing band, with a rhythm section tighter than Rod Stewart’s trousers. 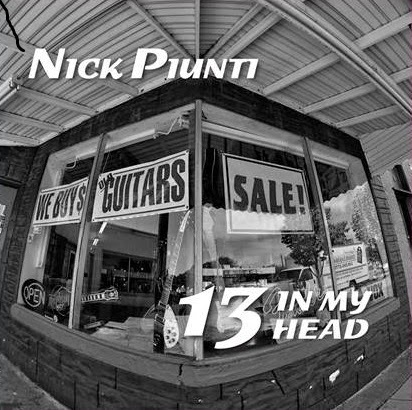 13 In My Head is very much a feel-good record and would make a great addition to anyone’s summer soundtrack.